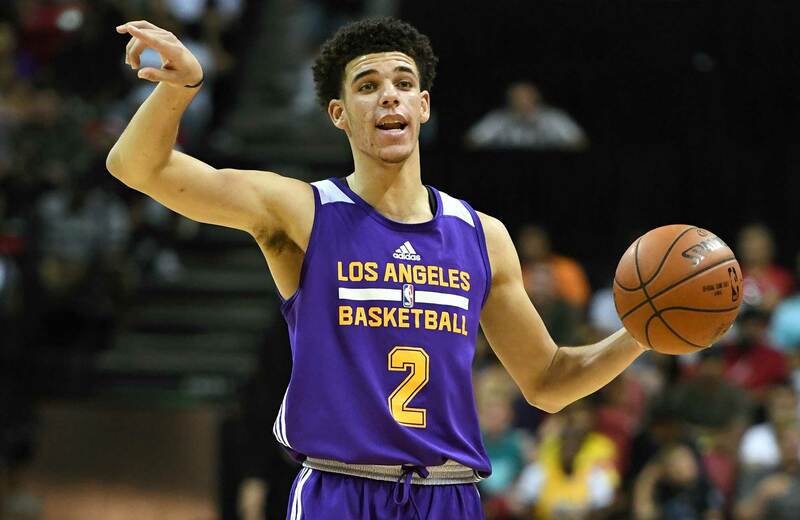 Lonzo Ball shined at the NBA's annual summer showcase like few others in recent memory. Who else made the cut for our 2017 All-NBA Summer League teams? LAS VEGAS — Lonzo Ball’s Summer League began with what his father LaVar termed the “worst game of his life” and ended prematurely with a calf strain that kept him out of Monday night’s championship win over the Blazers. In between, though, the Lakers’ rookie point guard was nothing short of sensational, leaving a mark on this annual summer showcase like few other players in recent memory and taking home 2017 Las Vegas Summer League MVP honors. Ball turned Las Vegas Summer League into his own personal reality show over the last 10 days, exciting audiences with his passing, keeping viewers guessing with his sneaker changes, and keeping it together despite shooting struggles and minor injury issues. Stars like Blake Griffin and Damian Lillard have launched their pro careers at this event before, but Ball’s run through Las Vegas might go down as the most hyped of all time. Magic Johnson, LeBron James, Ben Simmons and LaVar Ball all watched from courtside seats. The Thomas & Mack Center sold out in advance for the first time in the event’s history. His every move and sneaker switch was carefully documented by cameras and social media. The deciding factor in naming Ball as Summer League MVP was the same calling card that made him the No. 2 pick in June’s draft: His ability to make his teammates better. While Ball (16.3 PPG, 7.7 RPG, 9.3 APG) was a willing and able scorer all week, his best moments came when he was setting up his teammates by pushing the tempo in transition, running the pick-and-roll and collapsing defenses for drive-and-kick looks. His feel, vision and touch already look to be at an All-Star level, positioning him as a ready-made starter for the Lakers once the season opens. Ball registered two triple-doubles—something that hadn’t been done in a decade prior at Summer League—and topped out with a scintillating 36-point, 11-assist effort against Philadelphia. Throw in the Lakers’ team success, and the fact that other top lottery picks like Markelle Fultz, Jayson Tatum, De’Aaron Fox and Brandon Ingram all saw limited time, and Ball emerged as a no-brainer choice. 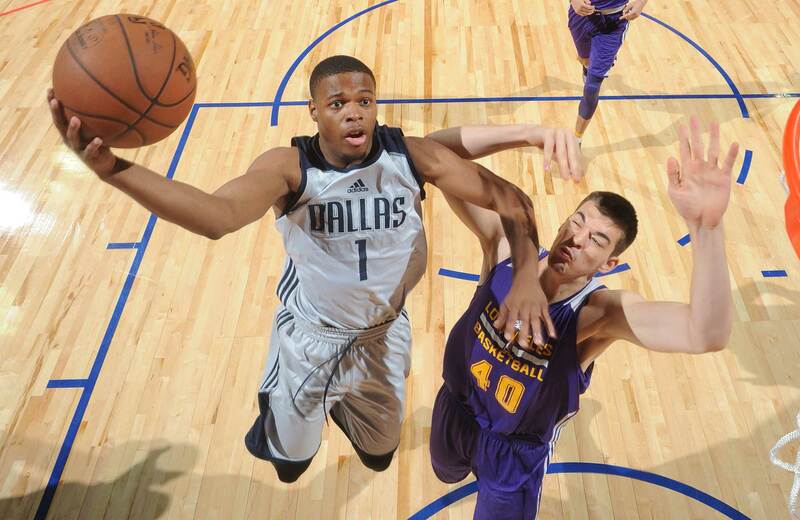 Joining Ball in the First Team backcourt is Mavericks guard Dennis Smith, Jr., who by the end of the tournament probably earned the “MVP runner-up” tag. Smith (17.3 PPG, 4.8 RPG, 4.2 APG), the ninth player chosen in June’s draft, brings a more conventional, attack-minded look as a lead guard, punishing defenders with powerful drives and an array of creative shot-generating dribble moves. The NC State product, who slipped a little bit on draft night, consistently wowed with his vertical leap and explosive finishes, but his most impressive characteristic was probably his relentlessness in seeking out favorable match-ups and scoring opportunities. While his effectiveness wavered from “good” to “unstoppable” depending on his streaky three-point shot, Smith was a nightmare cover all week long, leaving Knicks fans and Bulls fans to watch with frustration and envy knowing their teams passed on him in June. Portland rode Caleb Swanigan’s broad shoulders and big motor all the way to the title game, where he put up a monster 25-point, 12-rebound, 7-assist show in a losing effort. Swanigan (16.1 PPG, 10.6 RPG), 20, was the 26th pick in June’s draft, but he hardly looked like a rookie in Las Vegas, battling in traffic for contested rebounds, barreling to the hoop for paint points, and even mixing in a little dishing from the high post. While “Biggie” led Summer League in total rebounds and helped compensate for a poor Summer League from lottery pick teammate Zach Collins, it remains to be seen whether he will have the same type of physical impact against NBA-caliber bigs, who can bother him with length and punish him on the defensive end. For now, though, he makes for a nice bit of added depth on a Portland frontline that will remain in flux until team president Neil Olshey can slash some salary. Like Swanigan, Kyle Kuzma was a late first-round pick who outplayed his draft position in Las Vegas. The 21-year-old University of Utah product was a favorite target for Ball, who regularly found him with push-ahead passes in transition and on pick-and-pops for threes. At 6’9”, Kuzma (21.9 PPG, 6.4 RPG, 2.7 APG) appears to have the versatility and mobility to fill the stretch forward role, even if his decision-making often left something to be desired. Given that he was selected with the throw-in pick from the D’Angelo Russell trade, Kuzma leaves Las Vegas looking like found gold for the Lakers, especially after he claimed championship game MVP honors by pouring in 30 points and grabbing 10 rebounds in L.A.’s title win over Portland. Rounding out the First Team is Wayne Selden, who after spending three seasons at Kansas went undrafted in 2016, but shined in Vegas thanks to his advantages in age and experience. The 22-year-old, 6’5” wing made full use of those edges, bullying smaller defenders and working hard to create quality looks going to the basket. Selden (22.7 PPG, 3.8 RPG, 3 APG) finished the tournament ranked in the top five in scoring and helped Memphis to a 5-0 start and a trip in the semifinals. With numerous veteran rotation pieces departing from Memphis this summer, Selden should find himself competing for real minutes next season after spending time in the D-League last year. With its guard-driven style of play and relatively loose organization on the court, Summer League is a bucket-getter’s playground. 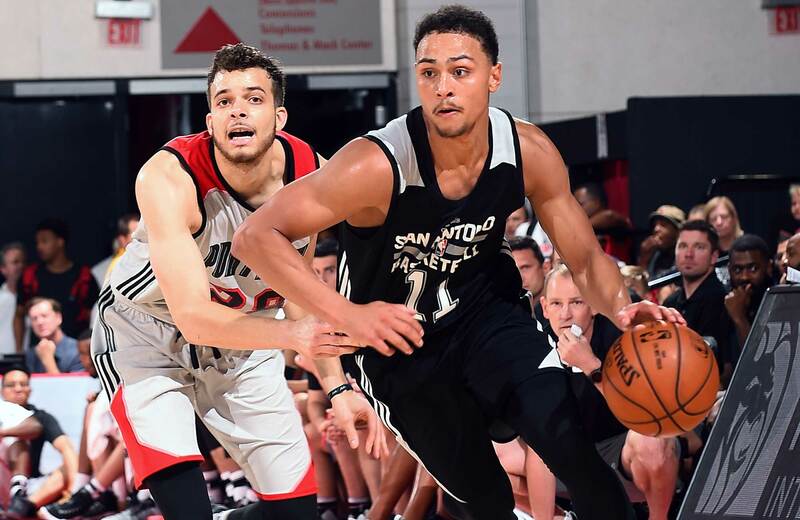 Bryn Forbes (26 PPG, 3.4 APG) is nothing if not a bucket-getter, and he led Las Vegas in scoring average for players with at least three appearances. After bouncing back and forth to the D-League last season before seeing limited action for San Antonio in the Western Conference finals, the undrafted 23-year-old guard had no trouble standing out against this level of competition. A confident shooter with good range, Forbes made a case that he should earn rotation minutes for the Spurs next season following the departure of Jonathon Simmons to the Magic in free agency. Like Forbes, Golden State’s Patrick McCaw might have been a little overqualified for Las Vegas after logging key minutes in the NBA Finals last month. The 6’7” wing averaged a team-high 20 PPG, showcasing the spot-up shooting, length and positional versatility that earned him minutes as a rookie last season. As the Warriors’ dynasty rumbles on, the former second-round pick will be an interesting name to keep an eye on, as his two-year rookie contract allows him to be a free agent next summer. Will someone be able to pry away McCaw, the type of three-and-d wing that’s always in high demand, from the defending champs in 2018? The only downside to Jayson Tatum’s Summer League was that the Celtics decided they had seen enough after just three games. The No. 3 pick in June’s draft had media observers and fans alike feeling nostalgic for the 1990s with his clean footwork and pretty turnaround jumper. Tatum (17.7 PPG, 8 RPG), 19, didn’t launch from distance much, but he was opportunistic in seeking out scoring opportunities around the basket. His comfort factor and immediate impact at this level bodes well for the Duke one-and-doner’s ability to hit the ground running next season for a Boston team that has every reason to believe it will make a return trip to the East finals after inking Gordon Hayward earlier this month. John Collins’s Summer League was about more than just dunks but, man, did he have a lot of dunks. The Wake Forest product even earned the excellent nickname “John the Baptist” for his ferocious posterizations. While the 19-year-old Collins (15.4 PPG, 9.2 RPG) still needs to fill out, his length, athleticism and ability to run the court helped him pop all week long. After a rough few years in which lots of proven talent has departed in trades and via free agency, the Hawks roster is suddenly in shambles. That sets up nicely for Collins to earn significant developmental time in a low-pressure environment as a rookie. To be clear, Josh Jackson’s game wasn’t always pretty: he shot just 3 for 16 from beyond the arc for the week, his mid-range floater was often unsightly, and he played with an intensity that sometimes strayed into recklessness. Nevertheless, Jackson (17.4 PPG, 9.2 RPG), the No. 4 pick in June’s draft, was a clear bright spot for a Suns team that received middling performances from 2016 lottery picks Marquese Chriss and Dragan Bender. The 20-year-old forward goes and goes and goes, whether he’s attacking downhill to the hoop off the dribble, busting up possessions with his defensive effort or flying through the air for rim-punishing dunks or off-the-backboard blocks. Honorable Mention: Donovan Mitchell, Jazz (only played two games); Brandon Ingram, Lakers (only played 1 game); Jaylen Brown, Celtics; Fred VanVleet, Raptors; Jakob Poeltl, Raptors; Troy Williams, Rockets; Bam Adebayo, Heat; Jarnell Stokes, Blazers.